Despite the notion that the social Web is all about sharing, conversation and collaboration, for Ron, it’s about how the documents he posts on JDSupra are dynamically aligned with search engines; allowing anyone searching for him or his expertise to find it. With the new LinkedIn Legal Updates application, it gives him another gateway; a gateway serving a fairly targeted business audience. Any time you can leverage what you post—post once and distribute it widely across the Web without added work—is a real plus. When you have a captive, targeted audience, well, it’s like getting a double dip. And that’s exactly what the JDSupra app for LinkedIn is all about. You can preview and install the application here. You don’t need to have a JDSupra account to access and download the app to your LinkedIn profile. 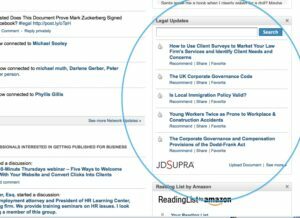 But if you do publish to JDSupra, you’ll want to connect your JDSupra account to the LinkedIn app so all of your content is fed seamlessly into the app and can be searched for or browsed within the application by anyone within the LinkedIn social network. So, you’re probably wondering about that client Ron got, right? Well, here’s the story. A mid-west lawyer’s client was served with papers in New Jersey. With no attorney relationship in New Jersey, the lawyer went to Google. Instead of blindly searching for a lawyer, he started by searching on the name of the guy who was suing his client. As it happens, a link to one of Ron’s documents on JDSupra that discussed how he had successfully litigated against the same plaintiff turned up. The lawyer reads the document and figures here’s a guy who knows who we’re dealing with. He then called Ron and within a few hours sent him a $10,000.00 retainer to handle the matter. 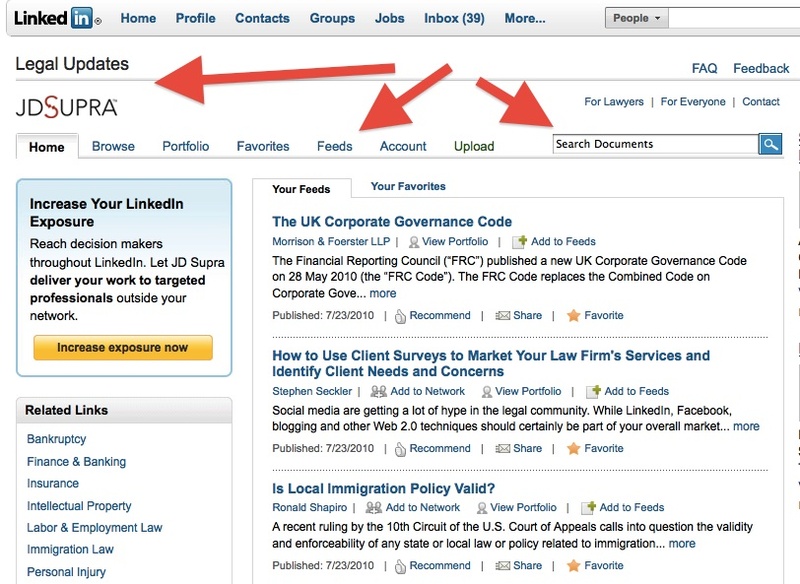 Some helpful instructions for making the most of Legal Updates on LinkedIn. 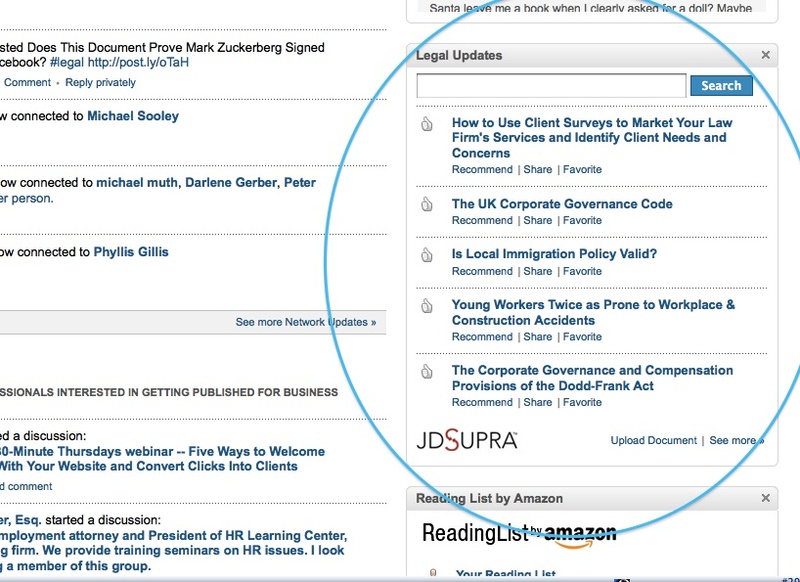 Connect your JDSupra account to the LinkedIn app. The heart of the app, EVERYONE on Linkedin can do it. 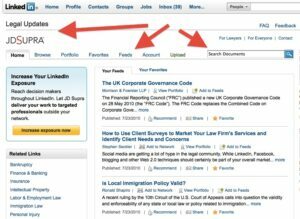 Customize your LinkedIn page feed. How to recommend, share, save Legal Updates. Got any good stories about getting new clients from publishing your content on JDSupra or LinkedIn? Share them below. For more social.lawyer stories check out my new site www.sociallawyers.com.